Gibraltar, a British Overseas Territory in Southern Europe bordered by Spain, the Mediterranean, and the Strait of Gibraltar has a total land area of 2.6 square miles and a population of around 30,000. Gibraltar is popularly known as the Rock after its major landmark, the Rock of Gibraltar which is riddled with around 140 caves. The four main sectors of its economy are financial services, internet gaming, shipping and tourism. Gibraltar is a popular port for cruise ships and most visitors are from Spain or Britain. The best time to visit Gibraltar is from May to September. The major attractions include the Rock, St. Michaels cave, beautiful beaches, water sports and proximity to Spain and Morocco. The cuisine of Gibraltar is a fusion of Arabic, Spanish, Mediterranean and British cuisines. Calentita (baked chickpea fritter) is considered as Gibraltar's national dish. Best of Gibraltar by Globetrotter 978-1847736239 $9 A 96-page guide book with sections on Overview, Highlights, Sightseeing, Activities, Shopping, Accommodation, Eating Out, Entertainment, Excursions, and Travel Tips. The first stamps of Gibraltar were ‘GIBRALTAR’ overprints on stamps of Bermuda released on January 1, 1886. The set (Scott #1 to #7) catalogs for around $1200 MNH and $800 used. The design shows the ubiquitous portrait of Queen Victoria (QV). Control of Gibraltar switched around a number of times during the colonial period until it was ceded in perpetuity to Britain by Spain in 1713. QV key types that followed in the 1886 to 1898 time frame along with certain surcharge overprints were the only stamp issues of Gibraltar till the turn of the century. Those sets (Scott #8 to #21, #22 to #28, and #29 to #38) are all sought after and catalog for upwards of $250 mint and over $300 used. Gibraltar released a set of ten stamps on May 1, 1903 showing King Edward VII. The set (Scott #39 to #48) catalogs for around $1100 mint and $1300 used. A sister set of seventeen followed between 1904 and 1912. That set (Scott #49 to #64) catalogs even higher in the $1600 range for mint and slightly more for used. The KEVII theme was replaced by the King George V (KGV) theme in 1912 with the release of a set of seventeen stamps on July 17, 1912. The set (Scott #76 to #92) catalogs for around $650 mint and around $1100 used. The first original issues debut in 1931 with the release of a set of four stamps depicting the Rock of Gibraltar. The set (Scott #96 to #99) catalogs for around $130 mint and $50 used. 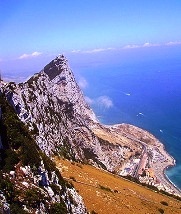 Gibraltor is dominated by the Rock of Gibraltar, a formation of Jurassic limestone. Common design types were the main stamp issues of Gibraltar till 1938 when Gibraltar issued a set of fourteen stamps in the KGVI and local scenes. The set (Scott #107 to #118) catalogs for around $175 MNH and $100 used. The designs show KGVI portrait, Rock of Gibraltar frontal view, Rock from north side, Europa Point, Moorish Castle, Southport Gate, Elliott Memorial, Government House, and Catalan Bay. Europa Point is the southernmost point of Gibraltar with a few notable buildings and a lighthouse from where the North coast of Africa (Morocco) can be seen on a clear day. Moorish Castle is a relic of the Moorish occupation of Gibraltar that started in 711 CE and lasted for seven centuries. Southport Gates are part of a series of walls and fortifications that defended Gibraltar from the mid 1500s. Catalan Bay is a fishing village on the eastern side of Gibraltar. Roger Elliott was an early British Governor of Gibraltar. A set of fourteen stamps released on October 19, 1953 showing local scenes. The set (Scott #132 to #145) catalogs for around $100 MNH and $90 used. The designs show South View, Tunny Fishing Industry, Southport Gate, sailing in the bay, ocean liner, coaling, airport, Europa Point, Strait from Buena Vista, Rosia Bay, Moorish Castle, Government House, and Arms of Gibraltar. The coat of arms that is still in use today is the one that the Spanish granted Gibraltar in 1501. A set of three stamps released on August 27, 1966 to mark the European Sea Angling Championships held in Gibraltar between August 28th and September 3rd. The set (Scott #177 to #179) is inexpensive and catalogs for around a dollar MNH or used. The designs show sea bream, orange scorpionfish, and stone bass. A long set of fifteen stamps released on February 10, 1982 in the Planes theme. The set (Scott #416 to #430) catalogs for around $35 MNH or used. The designs show Douglas DC-3, Vickers Viking, Airspeed Ambassador, Vickers Viscount, Boeing 727, Vickers Vanguard, Short Solent, Fokker F-27, Boeing 737, BAC One-eleven, Lockheed Constellation, De Havilland Comet 4B, Saro Windhover, Hawker Siddeley Trident 2, and DH-89A Dragon Rapide. A set of sixteen stamps released on September 15, 2003 to mark the enlargement of the European Union. The set (Scott #946 to #949 in sets of four) catalogs for around $7 MNH or used. The design shows National Flowers of newly added countries. The depictions are daisy (Latvia), cornflower (Estonia), rue (Lithuania), rose (Cyprus), maltese centaury (Malta), tulip (Hungary), carnation (Slovenia), dog rose (Slovakia), corn poppy (Poland), scented thyme (Czech Republic). The first coins of Gibraltar were British Colonial Copper Tokens issued in 1802. The issue catalogs for around $150 UNC. Regular Copper Coins denominated in half quarts were first issued in the 1840s. That issue catalogs for around $100 UNC. The undated proof is valued at around $750. British Crown coinage started in 1967 with the introduction of Copper-Nickels denominated in Crowns. The design showed QE bust in Obverse and Key below Castle with date and denomination in Reverse. The coin catalogs for around $5 UNC. Gibraltar has issued a number of commemorative gold coins and proofs over the years. Coins $3 and up Recent UNCs starts around $3. UNC year sets from the 1990s onward starts around $10. Commemorative UNCs from the 1990s and 2000s starts around $20. Recent Silver Crown Proofs starts around $50. Gold coins go well into the 100s and 1000s. Paper Money $5 and up Poundage from the 1980s onward in UNC starts around $5. High values and Commemoratives starts around $20. Low or Fancy Serial Numbers, Specimen Notes etc starts around $50. Specimen sets and bundles go well into the 100s. Visitors generally tend to buy alcohol, cigarettes, electronics, and jewelry given the duty free environment. Gibraltar crystal and stuffed monkeys are the popular reminders of this land. Art $10 and up 19th century rock of Gibraltar prints starts around $10. Portraits and other original works also start in the 100s. Antiques $10 and up 19th century maps start around $10. Some rare 18th century and prior maps go in the 100s.